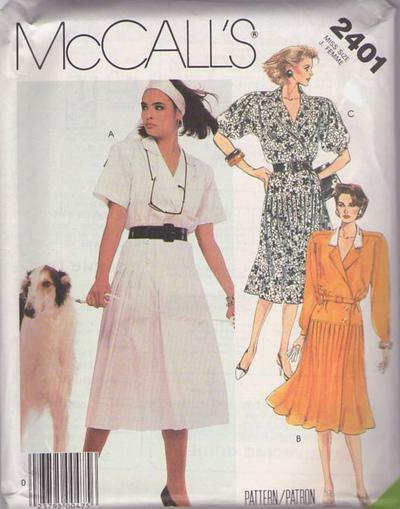 1986, 80s Career, Retro Work Clothing Patterns - MISSES' DRESS AND BELT: Front-wrap dress has lined back yoke with forward shoulder seams, notched collar, shoulder pads, partially elasticized waistline and pleated skirt with buttoned yokes. View A has patch pocket and short sleeves with machine-stitched hems. View B has contrast collar and long, tapered sleeves pleated to buttoned cuffs. View C has short sleeves pleated at caps and gathered to cuffs. All views: Top-stitch trim. Self-fabric belt with buckle or purchased belt.